France's surrender on June 22. The British now stood alone, awaiting Hitler's inevitable attempt to invade and conquer their island. Great Britain was in trouble. The soldiers rescued from Dunkirk were exhausted by their ordeal. Worse, most of their heavy armaments lay abandoned and rusting on the French beaches. 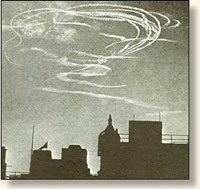 After a short rest, the Germans began air attacks in early summer designed to seize mastery of the skies over England in preparation for invasion. All that stood between the British and defeat was a small force of RAF pilots outnumbered in the air by four to one. Day after day the Germans sent armadas of bombers and fighters over England hoping to lure the RAF into battle and annihilate the defenders. Day after day the RAF scrambled their pilots into the sky to do battle often three, four or five times a day. Britain's air defense bent but did not break. By September, the Germans lost enthusiasm for the assault. Hitler postponed and then canceled invasion plans, turning his attention to the defeat of Russia. 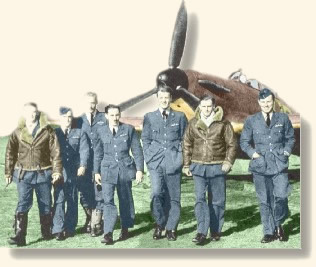 In appreciation of the RAF pilots' heroic effort, Winston Churchill declared: "Never before in human history was so much owed by so many to so few." The "Few" in Their "Finest Hour"
"Minutes went by. Green fields and roads were now beneath us. I scanned the sky and the horizon for the first glimpse of the Germans. A new vector came through on the R.T. [radio telephone] and we swung round with the sun behind us. Swift on the heels of this I heard Yellow flight leader call through the earphones. I looked quickly toward Yellow's position, and there they were! And then any tension I had felt on the way suddenly left me. I was elated but very calm. I leaned over and switched on my reflector sight, flicked the catch on the gun button from 'Safe' to 'Fire,' and lowered my seat till the circle and dot on the reflector sight shone darkly red in front of my eyes. The squadron leader's voice came through the earphones, giving tactical orders. We swung round in a great circle to attack on their beam-into the thick of them. Then, on the order, down we went. I took my hand from the throttle lever so as to get both hands on the stick, and my thumb played neatly across the gun button. You have to steady a fighter just as you have to steady a rifle before you fire it. My Merlin [the airplane's engine] screamed as I went down in a steeply banked dive on to the tail of a forward line of Heinkels. I knew the air was full of aircraft flinging themselves about in all directions, but, hunched and snuggled down behind my sight, I was conscious only of the Heinkel I had picked out. As the angle of my dive increased, the enemy machine loomed larger in the sight field, heaved toward the red dot, and then he was there! I had an instant's flash of amazement at the Heinkel proceeding so regularly on its way with a fighter on its tail. 'Why doesn't the fool move?' I thought, and actually caught myself flexing my muscles into the action I would have taken had I been he. Hurricane as the eight-gun squirt shot out. I gave him a two-second burst and then another. Cordite fumes blew back into the cockpit, making an acrid mixture with the smell of hot oil and the air-compressors. I saw my first burst go in and, just as I was on top of him and turning away, I noticed a red glow inside the bomber. I turned tightly into position again and now saw several short tongues of flame lick out along the fuselage. Then he went down in a spin, blanketed with smoke and with pieces flying off. I left him plummeting down and, horsing back on my stick, climbed up again for more. The sky was clearing, but ahead toward London I saw a small, tight formation of bombers completely encircled by a ring of Messerschmitts. They were still heading north. As I raced forward, three flights of Spitfires came zooming up from beneath them in a sort of Prince-of-Wales's-feathers maneuver. They burst through upward and outward, their guns going all the time. They must have each got one, for an instant later I saw the most extraordinary sight of eight German bombers and fighters diving earthward together in flames. A Londoner's view of the air war. I sailed boats when I was a child. In that moment, and as I was rapidly overhauling the Germans ahead, a Dornier 17 sped right across my line of flight, closely pursued by a Hurricane. And behind the Hurricane came two Messerschmitts. He was too intent to have seen them and they had not seen me! They were coming slightly toward me. It was perfect. A kick at the rudder and I swung in toward them, thumbed the gun button, and let them have it. The first burst was placed just the right distance ahead of the leading Messerschmitt. He ran slap into it and he simply came to pieces in the air. His companion, with one of the speediest and most brilliant 'get-outs' I have ever seen, went right away in a half Immelmann turn. I missed him completely. He must almost have been hit by the pieces of the leader but he got away. I hand it to him. At that moment some instinct made me glance up at my rear-view mirror and spot two Messerschmitts closing in on my tail. Instantly I hauled back on the stick and streaked upward. And just in time. For as I flicked into the climb, I saw, the tracer streaks pass beneath me. As I turned I had a quick look round the "office" [cockpit]. My fuel reserve was running out and I had only about a second's supply of ammunition left. I was certainly in no condition to take on two Messerschrnitts. But they seemed no more eager than I was. Perhaps they were in the same position, for they turned away for home. I put my nose down and did likewise." This eyewitness account was originally published in: Michie, Allan A. and Walter Graebner, Their Finest Hour (1941)and subsequently reprinted in Commager, Henry Steele, The Story of the Second World War (1945); Deighton, Lee, Fighter: The True Story of the Battle of Britain (1977). "Battle of Britain, 1940," EyeWitness to History, www.eyewitnesstohistory.com (2000). The Supermarine Spitfire and the Hawker Hurricane fighter aircraft were the mainstay of the British defense during the Battle of Britain. Although the slower of the two, the Hurricane accounted for 80% of the German aircraft destroyed during the battle.